The Lake Matthew Team, inventors of the Mars Terraformer Transfer (MATT), and ISEC (International Space Elevator Consortium) director Dr. Martin Lades, have announced the Omaha Trail design, a proposed system for high-efficiency transport between Earth and Mars. The Omaha Trail is designed to cut the propellant required per cargo flight and reduce the number of launches required from Earth. The Omaha Trail also reduces crew radiation exposure en route to Earth. For each of these important measures, the Omaha Trail produces more than an 80 percent reduction, relative to the reference metrics published or assumed by SpaceX as of this writing. Modest R&D can advance the Omaha Trail to technical maturity within the next two decades to enable operation of the Omaha Trail at Mars near the time of Omaha Crater's creation in 2036. 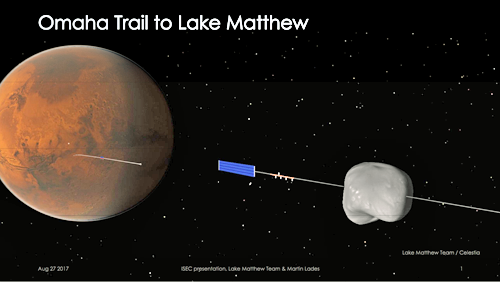 The proposed Omaha Trail integrates several components that work together to deliver cargo efficiently to the destination: Lake Matthew within Omaha Crater, Mars. The volatile-rich martian moon Deimos is proposed as the site for production and storage of propellants and water. Spacecraft dock at Deimos Lagrange point L1, where propellants and water are loaded via supply lines arrayed along a tether. A superconducting helical coil electromagnetic launcher is proposed, to enable efficient transfer of spacecraft from Deimos to Mars EDL, or alternately to Mars periapsis, for Earth-return trajectory. The rail launch system is tethered through Deimos L2. 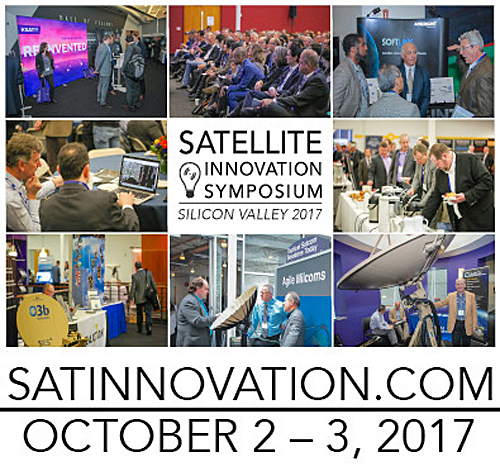 Dr. Lades has performed an initial numerical analysis for a Mars Lift space elevator. This lightweight system is designed for unpowered "rappeller" transport vehicles that lower cargo to the martian surface. Notably, Dr. Lades' quantitative results are the first to show how a Mars Lift tether can passively bypass the moon Phobos, and thereby circumvent the longstanding problem of Phobos/tether avoidance. A tramway is proposed, connecting the Mars Lift base station to Lake Matthew facilities at Omaha Crater. Power and alloy from Omaha Crater can speed delivery of cargo, with "trammer" vehicles running along HVDC cabling that spans sparse alloy pylons. The Omaha Trail's high efficiencies and excellent radiation protection can have commercial value, suggesting the development of the Omaha Trail as a commercial venture. An "Omaha Trail Consortium" is conceivable as a commercial successor or adjunct to MATT licensing, a Mars ISRU consortium, or a Mars mining consortium. The benefits of the Omaha Trail are maximized in coordination with the operation of Omaha Crater. 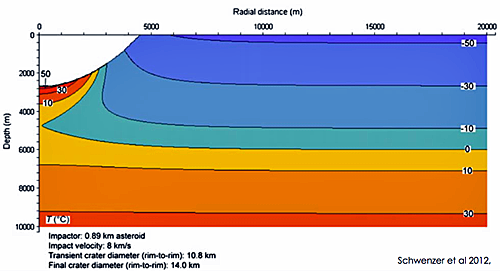 Together the combined Crater/Trail resources increase cargo efficiency by roughly two orders of magnitude, relative to SpaceX reference.